Frustration is now running deep in South Korea, with the scandal involving President Park Geun-hye and her longtime confidante Choi Soon-sil. Furthermore, uncertainties about the country’s diplomacy and economy are also rising after Republican Donald Trump’s upset win in the US presidential election. The unexpected developments at home and abroad are fueling public anxiety and discontent. 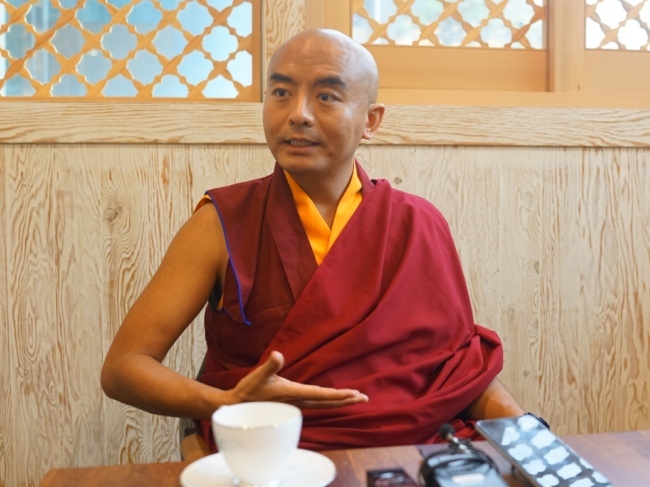 However, for Tibetan monk Yongey Mingyur Rinpoche, the biggest source of worry is less about the turbulent surroundings than the vast tangle of conflicts in the mind. 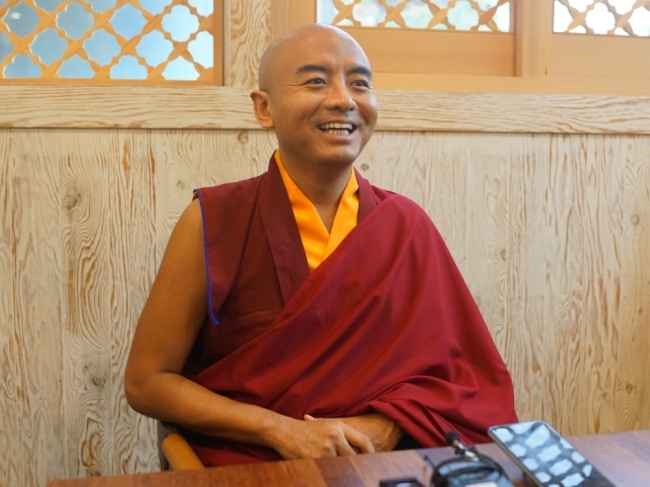 “Feelings of contentment, joy and a lot of appreciation that come within yourself is what I call happiness,” Rinpoche said in an interview with The Korea Herald on Monday. He was on a weeklong visit in Seoul to hold retreats on finding meaning in life. Rinpoche, who some call the “happiest man in the world,” highlighted the importance of taking control of one’s inner world. “There is no need to seek happiness from the outside, if it’s all problematic, chaotic and frustrating. You can find joy from the inside through meditation,” he said. “We all have a lot of wisdom in the brain, and love and compassion in the heart. But we are not normally content. People are interested in watching bad news because good news becomes normal,” he said. 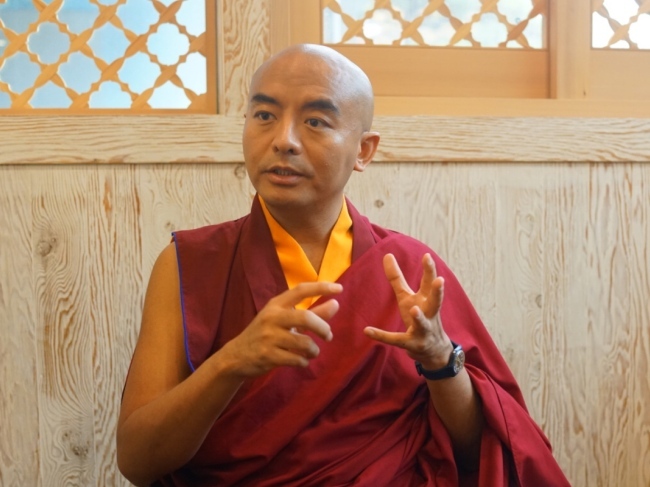 Rinpoche, who comes from a tranquil Nepalese village near Tibet, is widely respected among many Korean Buddhists and even nonbelievers for his penetrating insights into what is truly essential in life. In 2012, he decided to embark on a retreat and told his followers that he would not return until he gained a better understanding of the world. During this time, he slept in the streets and begged for food. He had near-death moments on his journey due to food poisoning and diarrhea. His mission during the retreat was clear: To develop his meditation and to learn about life. His rugged journey over four years made his mind clear as well as free of worries and anxiety, Rinpoche said. There is some scientific evidence supporting the values of meditation. In 2002, as part of his attempt to teach meditation, Rinpoche underwent a series of MRI scans at the Waisman Laboratory for Brain Research at Wisconsin University, which recorded his brain activities while meditating. The studies found that brain waves related to perception and consciousness dramatically increased during meditation. The results suggest that meditation might alter the mind in the way that the practitioner envisions. But Rinpoche said theory alone is not enough to ease the anxiety and pain that stems from our daily activities and encounters. “What I have noticed while holding retreats here is that people are very interested in meditation. I sense that they are more than willing to understand the practice and get messages from it. But sometimes we do good things but fail to understand what that really means. Sometimes we recognize our basic goodness and potential within ourselves but are too lazy to follow the principles,” Rinpoche said. Rinpoche said three things are important in helping people truly transform their daily lives through meditation. The first thing he does when he wakes up in the morning is to be thankful for his surroundings. “I appreciate that I have a bed. When I touch the ground I appreciate that I could hit the ground. Maybe you are working at a company or a businessperson, but whatever you do, start your day by trying to appreciate that you are alive,” he said. Rinpoche’s meditation teachings have been delivered through retreats in many parts of the world, including South Korea. Meditating is just like breathing, he told the audience during one of his retreats in Seoul. “While you are waiting for the subway or bus, you can meditate by counting your breath … and because you breathe all the time, you can meditate anywhere at any time,” he said. Rinpoche said meditation helps people to see their mind as it is. While meditating, people often find their mind obsessed with so many things, but this realization is a good sign. Finding inner peace is important, however, this does not mean we can overlook external issues, Rinpoche said. Son Ji-hyoung contributed to reporting.